A trip to Paris is not complete without a walk through the oldest planned square in Paris. Place des Vosges is located in the Marais section of Paris and once housed the famous writer Victor Hugo. Today you can find kids and adults enjoying the park that is set on the grounds inside the square. There are also great restaurants and shops lining the outside which makes for great people watching. Its been very busy in the RL studio for the past few weeks. I have a show this weekend at the taste of Lincoln in Lincoln Park. I will be in booth L33. The taste of Lincoln Runs 12pm – 8pm Saturday and Sunday. Please stop by and say hello! Today I have an interview with WBEZ Chicago Public Radio to talk about RL Photography and my Etsy business. I will be posting the link when its available so please stay tuned! In two weeks I will be back in one of my favorite cities in the world, PARIS!! I will be doing daily postings with photographs so feel free to subscribe to the blog so you don’t miss anything! I have been selling my 12×12 canvas pieces at farmers markets and art shows for the past couple of years. In person its easy to move around to create different sets of 3,4,6,9, or 12. This is an example of what you can do with these canvas pieces to create a wall and a fun story. Every piece can be customized. Choose from any image from my shop. Feel free to contact me with ideas and I would happy to place them in a virtual room! All available on etsy. There are over 12,ooo cafes in Paris. Which means they are pretty much everywhere you look! They come in all colors and line up facing the street so you can people watch. 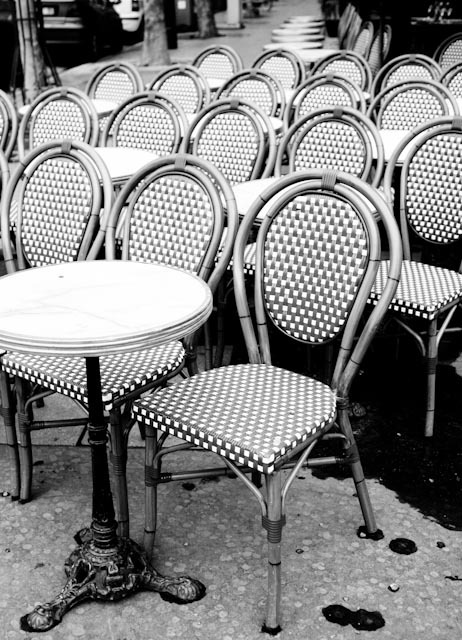 If you visit Paris, sitting at a cafe is a must! Here are a few of my favorite cafe chairs found around the city. The Paris Flea and Antique market is a sight to see. There is everything from small antique jewelry to large furniture pieces. Here are a few of my finds! This weekend I was at the Lincoln Park Art Festival here in Chicago. I had a large photograph on display of Lisbon, Portugal. There was much debate over the photo since a lot of people thought it was Paris. I have a similar photograph from Paris from the Palais Royal. Europe is filled with beautiful architecture! I will be at the Lincoln Park Art Fair this weekend July 16-177 from 12pm – 10pm. My booth #is 74. Its located by Fullerton and Racine Stop by and say hi!